Originally Published MDDI June 2001 Automation The tools a medical device company uses for designing automation equipment can make or break the transition to automation. The key is knowing what's out there. The tools a medical device company uses for designing automation equipment can make or break the transition to automation. The key is knowing what's out there. A medical device company's decision to automate can result in a streamlined manufacturing process and a more efficient workplace. Supporting the transition requires significant resources and skills, and the company or its automation partner must have a solid understanding of the available tools to effectively design the necessary automation equipment. Developing an equipment design within a 3-D solid-modeling environment enables a company to create the most robust design in the shortest schedule time. Since equipment designers typically conceptualize in a 3-D realm, they should convey their ideas to a 3-D medium for the design process. Solid-modeling software is ideal for this. The technology allows the designer to manipulate the model, investigate for design issues, and resolve them in the virtual environment prior to committing the design to manufacturing. This 3-D review makes for a better design, and can be extended well past the designer's desk to multifunctional design reviews across many disciplines. The reviewers can then visualize the equipment and make comments and changes before committing the design to production. Changing the virtual environment is infinitely easier and more cost-effective than having to rework equipment on the manufacturing floor. 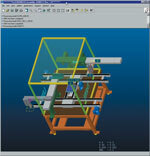 Snapshots of the design screens from Pro/Engineer, a 3-D solid-modeling computer-aided drafting (CAD) package from PTC (Needham, MA), showing percent of model processed as it is designed. There are many competitive 3-D solid-modeling computer-aided drafting (CAD) packages, including Pro/Engineer from PTC (Needham, MA). 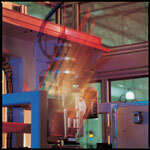 Pro/Engineer provides a flexible engineering and product development infrastructure. This infrastructure can rapidly respond to changing market conditions in support of company business initiatives such as strategic supplier collaboration, customer-tailored products, market-driven innovation, engineering productivity, digital-product confidence, and knowledge reuse. This software features innovative, next-generation behavioral modeling technology and ease of learning, use, and productivity. There are other mechanical CAD systems available to designers of medical devices. Products such as I-DEAS from SDRC (Milford, OH), CATIA and SolidWorks from Dassault Systemes (Suresnes, France), UGS and Solid Edge from UGS (Cypress, CA), Thinkdesign from Think3 (Santa Clara, CA), and Inventor from Autodesk (San Rafael, CA) are just a few. They vary from the high-end price range ($10,000–$30,000 per seat) to the mid-range point of approximately $5000 per license. Analysis technology is a vital component of the software tool kit. Products such as Pro/Mechanica from PTC allow design engineers to quickly and easily address the function, assembly, and design of every part—providing early insight into how a product will perform in the real world. Using the software, engineers can explore various design scenarios and quickly converge them for the optimal design, eliminating a compromise of quality or an overdesigned product. 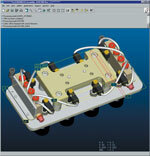 Users can seamlessly download Pro/Engineer models to Pro/Mechanica for analyses. Fringe plot showing stress, from PTC's Pro/Mechanica analysis software, which allows engineers to address the function, assembly, and design of each part of a product in early stages. Pro/Mechanica analyses (such as how an assembly will behave in motion) capture product behavior and provide the necessary insight to create the best possible product, all within an easy-to-use environment designed for the engineer unfamiliar with analysis techniques. The software equips design engineers with functional information about the products they are modeling while automating as many of the technical aspects as possible. Users define loads, constraints, joints, and temperatures directly on the model geometry—allowing concentration on the product rather than on the mathematical abstractions used for analysis. Pro/Mechanica uses precise design geometry without faceted approximations, ensuring more-accurate results. It enables multidiscipline simulation with associative solutions for motion, structural, thermal, and vibration analysis. VSA-GDT/Pro software, from UGS, is directly integrated with Pro/Engineer through the use of Pro/Toolkit. VSA software uses the geometry, tolerances, and assembly process information directly from Pro/Engineer whenever possible to provide the highest level of integration with the user's product data management system and for ease of use. In order to determine if the tolerance scheme created in Pro/Engineer is correct according to the standards of the American Society of Mechanical Engineers, the American National Standards Institute, and the International Organization for Standardization, VSA-GDT/Pro uses a patented, math-rule base to analyze the tolerance scheme created in Pro/Engineer. The software verifies that each feature is correctly constrained in form, orientation, location, and size. It also ensures that the feature-control frames are syntactically correct and that each feature is related to the master data-reference frame through one unique path. The best equipment design is not necessarily the best solution unless it is designed in the context of the entire manufacturing process. To make a medical device–manufacturing system successful, the design team needs to evaluate the material and labor flow in the process. There are software tools that can simulate production at the plant level where material, labor, MTBF (mean time between failure) efficiencies, and bottlenecks in the process can be evaluated again before committing the system to production. Design for Assembly (DFA) from Boothroyd Dewhurst Inc. (Wakefield, RI) is a core software tool for concurrent engineering work. It not only allows users to quantify assembly time and labor costs, but it also challenges users to simplify the structure of products and thereby reduce part and assembly costs. Companies have recorded millions of dollars in savings simply by applying DFA at the early stages of product design. The assembly time standards included in the software are based on extensive research confirmed by years of industrial usage. They cover wire-harness and printed circuit board assembly, as well as mechanical assembly. There are full-featured, user-editable databases for a company's standard items and special operations. The software has been successfully applied across a broad range of products from disk drives to satellites, and from elevators to analyzers. Simulation of a plant layout from the AutoMod suite of software from AutoSimulation Inc. (Bountiful, UT). The software is used for design, analysis, and emulation of complex systems. The AutoMod suite of simulation software from AutoSimulation Inc. (Bountiful, UT) provides tools for design, analysis, and emulation of complex systems. AutoMod combines virtual- reality graphics with a flexible, powerful, discrete, and continuous simulation environment. Templates of commonly used components facilitate quick and accurate modeling of a wide range of systems, such as manufacturing operations, materialhandling systems, tanks and pipe networks, warehousing and distribution centers, transportation and logistics, baggage handling and airport operations, and semiconductor manufacturing. Determine the optimal equipment configuration. Decide how much equipment to buy. Identify bottlenecks in the operation. Communicate changes in the design. Test equipment controls prior to installation using emulation. Simulation does not have to be at the plant level only. Difficult processes should be simulated to mitigate the risk in a new process. Being able to simulate or animate the motion of the equipment in a new process allows the design team to confirm the feasibility of the process. 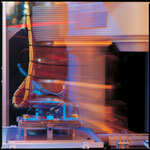 Another proven technical tool for simulation is Adept Digital Workcell from Adept Technologies Inc. (San Jose). The software is a powerful 3-D virtual robot and cell simulator that focuses on small-parts assembly and material-handling applications. Using AdeptWindows PC software, users have the ability to program virtual workcells using native AIM and V+ programming codes. The design team can execute programs in real time using the AdeptWindows Controller to drive the virtual robots and cell peripherals. Software development productivity is greatly increased, since programming and debugging can be done before or during cell assembly. Adept Digital Workcell is integral to facilitating rapid deployment automation by even further reducing the time required to implement robot systems. The Adept Digital Workcell allows organizations to implement concurrent engineering, debug programs in a safe virtual environment, increase programming productivity, and reduce software-development lead times and time to market. In addition, it serves as a valuable training tool. Probably the most critical software tool for medical device equipment design is the product data management (PDM) software for the various design and simulation tools. PDM systems provide a secure vaulting location for all the designs, as well as a focal point to enable concurrent engineering. Electronic data management ensures that all users are accessing the latest revisions, provides backups, and enables the sharing of data between multiple users and even multiple geographic locations. A PDM system also can fulfill quality system requirements. PTC offers Pro/Intralink as a work group management solution for product development using Pro/Engineer. It lets Pro/Engineer users facilitate design-team collaboration and manages the power of Pro/Engineer associativity. It provides a dynamic, collaborative environment that supports Pro/Engineer's rapid and effective design approach. The software manages the relationships between Pro/Engineer deliverables from conception to design and manufacturing. It simplifies the Pro/Engineer data management activities necessary for product development by transparently incorporating them into the design process. Pro/Intralink enables concurrent product design by communicating interrelated changes to the various engineers affected, so they can incorporate design changes and update current information. Simple, process- focused tools capture and execute management tasks so that engineers can concentrate on innovative product design. The software simplifies the data management activities of engineers so they can be productive. It offers powerful tools to incorporate information management activities directly into the design process. Many such tasks that need to be done in Pro/Engineer can be accomplished faster and more efficiently by using Pro/Intralink. By facilitating design reuse, Pro/Intralink makes effortless the copying and renaming of existing designs and updating of related deliverables, such as drawings. Pro/Intralink delivers benefits to both the engineering workgroup and the extended enterprise. Using Pro/Intralink Gateway allows engineering information from Pro/Engineer to be shared seamlessly throughout the enterprise, enabling true enterprise-wide collaboration. Automation can enable a company to improve its performance, but can only be effective if equipment design is supported with the right skills and tools. The medical device manufacturer should give as much thought to the automation design software tools as to the decision whether or not to automate. WHEN IS THE RIGHT TIME TO AUTOMATE? Production capacity is overly constrained. Per-unit cost is too high. Finding skilled labor is a problem. Operator safety and health are concerns. Data collection and tracking are unreliable or burdensome. Increasing capacity and production rates and decreasing per-unit cost are the historical reasons for implementing automation. Today, other issues such as consistency, material waste, quality, variability, and safety are equally important. Achievement of these improvements is not guaranteed, however. Implementers need to work towards these improvements, particularly when automating nonstandard processes and difficult-to-handle products. In some cases, manufacturers never achieve the desired improvements, and manual operations turn out to be more cost-effective. Capacity, yield, quality, and safety are not pressing concerns. Lack of resources and skills to support automation. What are the manufacturing economic metrics? What are current and future production requirements? What are the potential improvements regarding cost, yield, quality, and safety? Does the company have the necessary technical expertise? Is there a process that can be automated? Have products been designed for manufacture and assembly? Does the engineering support exist to help evaluate different means of automation? Can the organization support the entire automation cycle—analysis, design, implementation, operation, and maintenance? What is a feasible project schedule? What are the milestones of that schedule? Can the company make the assessment and the decisions? For many companies struggling to answer the question of whether to automate, it's beneficial to seek an automation partner, especially if the organization lacks the expertise and skills to make the difficult but critical decisions. The partner should be familiar with applicable regulations, directives, and guidances, such as the FDA quality system regulation and/or EU medical device directives. A good partner should be able to provide special technical capabilities such as experimental design, prototyping, testing, and validation. The partner should also have some specific expertise in relevant areas such as biocompatible materials and coatings, medical packaging, or sterilization technologies. Various scenarios commonly arise in the automation decision process. Two important ones are when existing products will not change and when new products are still evolving. Manufacturers are typically unwilling to make changes to products that are already in production. This is especially true of medical device manufacturers wishing to avoid additional validation costs and delays. They seek automation only for the manufacture of those products. In these cases, the issues that arise and the expertise that the partner requires centers around process automation and equivalency demonstration. Other times, automation is associated with a new product introduction. The product is still in the design phase, but the manufacturer wants to begin working on the manufacturing process. This is often called concurrent, or simultaneous, engineering and is an ideal opportunity to bring in an automation partner, provided the partner can contribute to both product and process development, and optimize the various design trade-offs. In the case of concurrent engineering, the partner should have product design expertise, specifically medical device product design. The partner should also be able to adapt to evolving projects and make adjustments and document changes as issues develop.